The Rural Crescent: Fact or Fiction? Mike May is a partner with the law firm Albo Obelon. He specializes in civil litigation and criminal defense. Mike represented the Occoquan District on the BOS for 9 years where he developed the reputation as a proponent of sensible smart growth land use policies and open space preservation. Charlie Grymes is a founding member and the Chair of the Prince William Conservation Alliance. He is a recovering Federal bureaucrat, retired after working for the Department of the Interior for over 30 years. His family has been in Virginia since the 1640's, and he now teaches the Geography of Virginia class at George Mason University. Brentsville Supervisor Jeanine Lawson has been serving on the Prince William Board of County Supervisors since winning a special election in December of 2014. Jeanine campaigned as a strong advocate of the Rural Crescent and remains committed to protecting its preservation. Currently Supervisor Lawson represents the BOCS on the Agriculture and Forest District Advisory Committee as well as the Virginia Association of Counties, Environmental and Agriculture Steering Committee. 2014 Rural Crescent Study Report & Videos from PWCAs March 2015 Forum. At the September 20, 2016 Board of Supervisors meeting, Planning Director Chris Price is recommending initiation of three Zoning Text Amendments to revise the County's Rural Area Preservation policies. PWCA supports the adoption of Purchase of Development Rights program, a meaningful, well known and essential tool in rural preservation toolboxes. Any consideration of a Transfer of Development Rights program and changes to Rural Cluster regulations before implelmenting and assessing the benefits of a Purchase of Development Rights program is premature and should be rejected. More information is included in our previous comments to Supervisors, below or click HERE for the pdf version. The current staff report includes hundreds of pages of information, some old and some new. We will post additional information on proposals as we wade through the documents. Prince William Conservation Alliance supports the Rural Crescent, as established in 1998 with the goal to help Prince William County “avoid the negative economic, social, and environmental characteristics of sprawl development.” The primary goal of the Board of County Supervisors in 1998 was to constrain the rising costs of providing public infrastructure and thus limit property tax increases, but the designation of a Rural Area also created the opportunity to preserve green open space and farmland. The County has not acted on that opportunity – yet. Despite considerable talk over the years, incentives for Rural Crescent farmers and green open space initiatives are largely unchanged. A Purchase of Development Rights (PDR) program, as called for in the County's Comprehensive Plan and recommended by the 2014 Rural Crescent Study, has not yet been adopted and funded. PDR programs are a meaningful, well known and essential tool in rural preservation toolboxes. 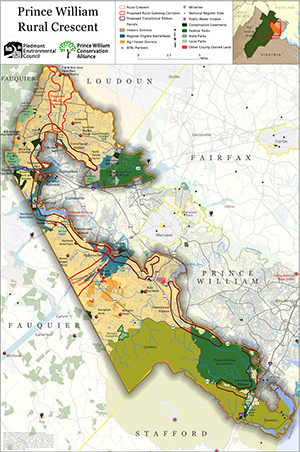 For example, neighboring Fauquier County has an active PDR Program that has protected more than 10,500 acres of land. The Fauquier County program is funded through a special real estate tax levy currently set at just $0.006 per $100 of assessed value. In Prince William, farmers are already struggling with diminished opportunities to secure adequate land for farming operations. They rightly want to know if Prince William County is serious about protecting farmland. Adoption of a PDR program would accomplish this goal. Residents in the Development Area as well as in the Rural Area want the county government to help commercial farmers retain their traditional activities in Prince William. Opening the Rural Crescent to increased residential densities would diminish the County’s capacity to preserve a way of life based on agriculture as well as the countywide benefits associated with reducing sprawl development. Adoption of a PDR program would signal a meaningful commitment to protect farmland as well as follow through with re-development initiatives and keep taxes lower. improvements to development areas, increasing the County’s ability to attract economic investment and keep taxes lower. The County’s 2014 Rural Preservation survey showed that Prince William residents support PDR programs and that the majority are willing to pay to protect open spaces. Before investing staff resources or entertaining any discussion of policy changes to the Rural Crescent, Prince William County needs to follow through and take advantage of the available tools needed to ensure a robust rural area and associated benefits. Item 9A on the August 3 BOCS Agenda proposes a piecemeal approach to an update of the Comprehensive Plan, including Rural Crescent policies. We urge the Board of County Supervisors to instead adopt a comprehensive approach that includes community involvement to ensure meaningful and mutually supportive relationships between the individual chapters. In addition, we urge you to reject initiation of any discussion or investment of staff resources aimed at revising Rural Crescent policies before implementing and evaluating a funded PDR program – a fundamental and essential tool commonly used to protect rural areas and their associated countywide benefits.